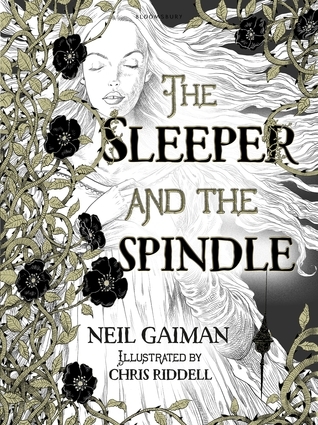 The Sleeper and The Spindle, written by Neil Gaiman and illustrated by Chris Riddell, is a stunning new fairy-tale picture book for Young Adults. Or, rather than a picture book, perhaps I’ll call it an illuminated story. The tale is dark and the pictures more so. I was thoroughly entranced for the twenty minutes it took me to read Gaiman’s words and examine all the neat little details in Chris Riddell’s pen drawings. 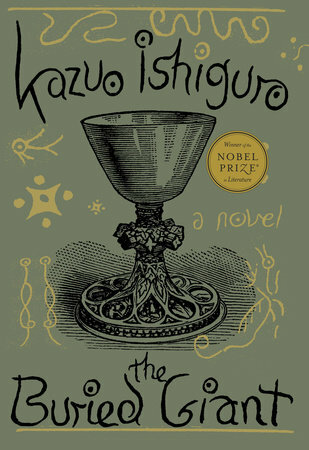 Though the story is simply told, much like Gaiman’s earlier fairy-tale novel Stardust, the traditional style highlights the plot’s unique surprises and occasional shining side-remarks. The queen had a name, but nowadays people only ever called her Your Majesty. Names are in sort supply in this telling. Two kingdoms lie on either sides of an impassable mountain. They share a border but nobody can get across to visit. Three dwarfs burrow underneath, though, in order to get their Queen the finest silks in Dorimar. The Queen is going to be married soon. It seemed both unlikely and extremely final. She wondered how she would feel to be a married woman. It would be the end of her life, she decided, if life was a time of choices. But the dwarfs don’t come back to Kanselaire with gifts of silk. They come back with terrifying news: a sleeping sickness is taking over the land and is moving ever-closer to their own realm! The Queen (who once slept a year under these particular dwarfs’ care and came out of it just fine) postpones her wedding, dons a mail shirt, grabs her sword, and leads the dwarfs on a quest to wake the sleeping princess, up in her tower guarded by thorns. The way is sometimes dark: they travel underground. It is sometimes frightening: cobwebby sleepwalkers move through a town like zombies. And their quest is not quite what it seems. The Queen kisses the Princess to wake her up, and that’s nothing compared to the real twist that follows. Neil Gaiman’s description of evil stepmothers and youth-hungry enchantresses is spot on when the Queen confronts that evil fairy (or was she a witch or an enchantress? The folks at the inn can’t quite agree) who used the prick of a spindle to put the whole kingdom to sleep. The Queen is young and she is brave, but her own past experiences with such cruel sorts makes her adventure in the tower more powerful than a mere rescue attempt. The Sleeper And The Spindle isn’t a love story. Though it is short the tale followed a path just between familiar archetypes and new visions to feel full and satisfying. 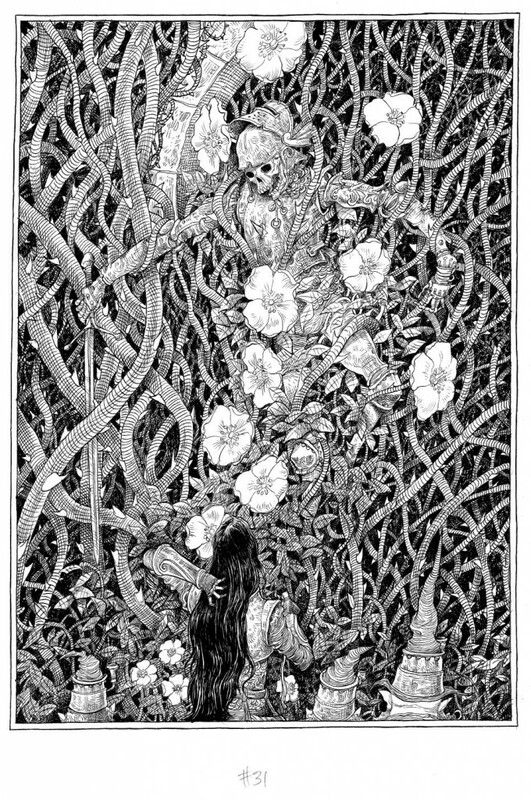 Chris Riddell’s drawings are equal measures disturbing and beautiful. They’re certainly phenomenal, and must have taken a great deal of work. Mostly black and white with little highlights of gold, they contain skulls and thorns a’plenty, but also faces that seem delightfully alive even when the figure is fast asleep. The Queen is lovely with her raven-black hair, and I adored the dwarfs’ innovative hats. If this is the sort of world in which fairy-tales happen, then I can easily understand why beauty, darkness, and grotesque wickedness are so important. I can’t imagine the story being read without the illustrations, or the pictures without their accompanying tale. They just fit together so nicely into the sort of book you want to own for centuries. The Supernatural Enhancements is a cryptograph mystery, a haunted house horror story, and a Southern Gothic as seen by Europeans. It’s made up of diary entries, transcribed conversations, letters, and more. If you like found footage stories and things that go bump batshit crazy in the night, check it out. A. and Niamh come to Point Bless, Virginia not knowing what to expect at Axton House. A., our otherwise nameless protagonist from an unspecified European country, inherited the enormous, secluded mansion from a recently deceased distant cousin. Ambrose Wells and A. never met, but Wells died the same way his father did: plunging to his death out the window at the age of fifty in highly suspicious circumstances. Compared to other, older rumors about Axton House, a few odd window-tragedies are comfortably dull. The family that gave the estate its name, before Wells’ line bought it up much later, was known for inhumane cruelty, especially to the slaves who once lived on the plantation. Everyone in town knows the place is haunted. A. is a skeptic who “wants to believe” (he watches a lot of X-Files) and Niamh is mute but not without opinions, but the two of them will have to re-think their relationship with reality as they delve into the secrets hidden behind every door of Axton house, and every twist of the maze around it. The ghost stuff is cool, of course, because I love ghost stories. Creaky floorboards, electrical disturbances, human shadows standing behind the shower curtain… what fun! Even more interesting, though, were the secret codes and hidden messages A. and Niamh find all over the place. Ambrose Wells belonged to some super-secret society of Rich Old-Fashioned Dudes Having Thrilling Global Adventures. Every year, on the Winter Solstice, they would meet at Axton House for some annual, esoteric observance. Since Niamh and A. don’t know what the meeting entails, they need to put the pieces of Ambrose Well’s haunted life together before the Solstice to find out if these are just old guys playing with a “bourgeois passtime” or desperate men on a dangerous mission. There are codes and maps and cyphers and grids so complex they require mathematics. There’s a sinister maze in the backyard. There’s an enormously tall German butler with many secrets behind his respectable facade – I kid you not! Too many threads from different mysterious genres tied together in one tangle? Maybe. But I liked A. and Niamh enough to follow them, to be confused and frustrated with them, then rejoice whenever they figured something out. Of all the characters, these two major ones were probably the only fully fleshed-out persons to be found. But it didn’t really matter that various lawyers, businessmen, neighbors, and Oddly Wise Far Away Aunts Of Dubious Relation seemed built to further the story, sometimes. This is not a realistic tale by any means, so a Southern Gothic stereotype or an overly expositional old man (pipe included!) here and there seemed to fit right in. I’d also like to mention that The Supernatural Enhancements is Edgar Cantero’s first book written originally in English. The dialogue and descriptions occasionally veered from cliché to slightly pretentious, but at no point did I have to think “well, I guess this is good enough for someone who doesn’t usually write in English.” It was just good enough, period. So well done there, Mr. Cantero. Especially given the pieced-together method of presentation, with all sorts of scholarly articles and even security footage transcriptions thrown in, he had to change voices an awful lot – frequently American ones in a region known for its eccentricities. Most of them were pretty well done. My favorite voices, without a doubt, were our main characters’, though. A. and Niamh had an interesting relationship: he a twenty-something scholar with the sudden need to never work again, she a seventeen year old punk kid from Ireland with some roughness in her past and no voice to speak of it. Their conversations – her scribbling, him speaking – and even the looks they gave one another amongst all the weirdness were endearing. So who cares that I still don’t get how Aunt Liza fits into this picture? Or that the book’s denouement, while suitably horrifying, seemed to come out of nowhere and almost devalued some of the mystery that had been building up? I liked these kids and I liked solving the frightening mysteries of Axton House by their sides. If I had to describe the style of Cantero’s book to someone, I guess I would call it a (slightly) less gimmicky House Of Leaves meets movies like The Skeleton Key and Paranormal Activity, if characters who wish they were in a Donna Tartt book visited Virginia. And yes, there were some Da Vinci Code / Angels and Demons elements too, with all the arcane spirituality and complex codes. I’m not sure if The Supernatural Enhancements was quite as good as House of Leaves, and it definitely can’t come close to Tartt’s genius, but it a disturbingly fun mix all the same, and terribly absorbing. I compare the book to other stories only to try and place its style; there were original elements here that impressed me even despite the far fetched and sometimes gruesome details. Suspend your disbelief for an evening, turn on all the lights, and get lost in Axton House for a while. Be it known that I read an advanced copy of this book and some details may change before publication in late September. Wow. This book came out of nowhere to knock me down. Captive children under oppressive rule, world-dominating Artificial Intelligence, and post-ecological meltdown politics usually tire me out but… damn. The Scorpion Rules gives me hope that sharp tongued AI and barely-sustainable futures can feel new. And heartfelt. And bloody devastating. Greta is a Child of Peace. She is also the Duchess of Halifax and Crown Princess of the Pan Polar Confederacy. She lives at a Precepture somewhere in what was once Canada. At the Precepture, hostage children live almost monkish lives, farming and receiving a rigorous education. They learn about the ancient Stoics and sustainable development. They learn not to repeat the mistakes of history. It’s one of many similar Preceptures scattered around the ravaged globe, where a child of each and every global leader lives as a hostage. This is how Talis made war personal: anyone who wants to rule must have children, so that in case of war, that child’s life will be forfeit. But if they live to be eighteen, they become rulers and must soon send their own children to be held as insurance. The Scorpion Rules begins with one of Talis’s messengers – a Swan Rider – coming to execute a Child of Peace: a friend of Greta’s. It’s an emotionally jarring way to dip one’s toes into a story, and sparked a slow burn of conflicted horror in me as I read on. Greta and her friends know why they’re hostages, and they know that this system is the only successful way to keep violence minimum out in the struggling world. The Abbot who teaches them – another AI – is at the same time kindly and pitiless. This is the trouble with artificial intelligence, trying to save the human race through logic: logic understands fear and love (that’s how the whole hostage thing works) but it doesn’t show any mercy. The war that kills Greta’s friend sees the creation of a new state called the Cumberland Alliance, so the ruthless Cumberland general’s grandson joins them as a hostage. Elián was not brought up to be a royal captive and he doesn’t believe in facing one’s fate with dignity and grace. He struggles against Talis’s system, the Abbot’s authority, and the beliefs which Children of Peace take so seriously to heart. He jokes that he’s Spartacus and refuses to give up or stop smiling, even when robotic proctors electrocute him so badly he falls to the ground. It was easy to think, I, too, would be brave and defiant like Elián in this situation. But would I really? One of the best things about The Scorpion Rules is the powerful moral ambivalence. When Elián acts out, they all get punished. But his stubbornness opens Greta’s eyes to the hideousness of their situation, and once she starts to see how wrong things are, she can’t return to being the stoic princess, prepared and willing to die with dignity whenever a Swan Rider comes calling her name. Too bad Elián’s grandmother is likely to declare war on the Pan Polar alliance at any time, desperate for the water to be found in the Great Lakes. Knowing that they’re likely to be executed together, there’s shouldn’t be much stopping Greta and Elián from taking a stand against their captivity. But there’s no escape from all these moral quandaries: without the hostages, can there be peace? Will these children’s families really sacrifice them in order to fight? How can the Abbot be their torturer and their nurturer at the same time? Are they willing to endanger their friends for a chance of freedom? It’s the sort of plot that tears you into pieces, because there are no right answers. Erin Bow writes about a future that could stem from our very messy present, and she doesn’t see an easy way out. The seven teenagers who make up Greta’s cohort come from all over the world, and have varying opinions about their captivity. Thandi is harsh with her friends sometimes, though Greta eventually learns what happened to make her so guarded. Gregor is easily frightened, nerdy, and deadpan in his sense of humor. Da-Xia, Greta’s room-mate and best friend, is small and beautiful but carries the powerful bearing of the goddess-queen she will someday become. Greta was always so composed and smart, until Elián’s words got under her skin. I grew intensely attached to each of these kids as they argued, and worked together, and comforted one another, always watched by the panopticon, always steeling themselves for tragedy. So when violence comes right to the Precepture’s doors, I was all sorts of nervous about how things might turn out. Halfway through The Scorpion Rules, the psychological turbulence and sci-fi philosophy became suddenly action-packed. I’ve already summarized too much, so I’ll just say: the no-real-good-guys trend continues like woah. There’s torture. There’s disguise. There’s a funny scene with goat pheromones. There’s a more nuanced romance than I originally expected. There’s an awful lot of blood. Talis himself gets a speaking role that’s a little more intimate than The Utterances, and even though he’s definitely a Heartless Robot Dictator I must admit that he became one of my favorite characters. Don’t get too attached to anyone in this book, though, because no one is safe. I was too wrapped up in furiously turning the pages to wipe away my tears, but my face was definitely damp at one point. Maybe The Scorpion Rules could have been a little shorter, as it is a long book despite the short span of time in which the action happens. I enjoyed the pastoral gardening scenes and the goat cheese making because these details helped to conjure the monkish serenity of their prison, but I would have been just as happy without them. 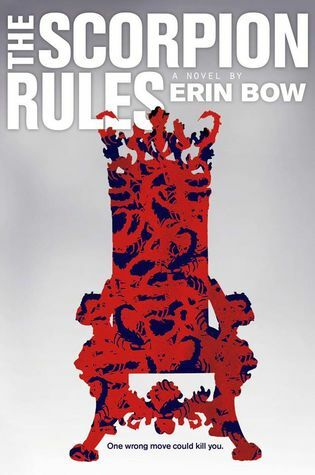 Aside from a few dips in the pacing, Erin Bow really delivered with this book. Complex characters, a many-layered plot, and philosophy that makes your heart hurt all come together to tell a story that leaves you reeling. I’m not sure if there’s a sequel expected for The Scorpion Rules. I would definitely read more on the subject – even if just to read more of Talis’s deliciously flippant Holy Utterances – but the ending was also oddly satisfying. Not satisfying like everything’s going to be fine. Because there’s no easy way out of the dire circumstances human kind has to face, here. But satisfying as in everyone has to do what they think is best, and god do I hope they’ve made the right decisions. And I hope, too, that our future never quite comes to this.